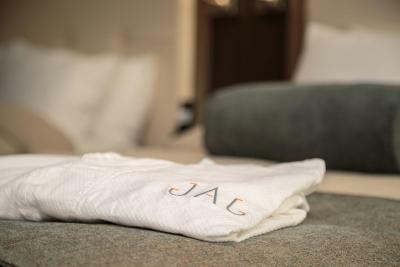 Lock in a great price for JAG Boutique Hotel – rated 9.4 by recent guests! So close to mile one. Excellent for attending concerts. Just a couple minutes to walk to and from. The dinner we had and the dinning room staff were amazing! 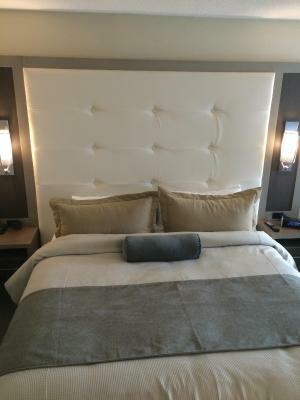 I already wrote a review since we stayed at this hotel at the beginning and end of our trip. This is my favorite boutique hotel, and I wish that I could stay there more often but St. John's is very far away. The front desk personnel were very welcoming and helpful. The food in the restaurant was very delicious, and the decor and music were very uplifting. It is a "happening" place. The room was huge as well as the bathroom. My only suggestion would be that there be a towel rack on the wall. 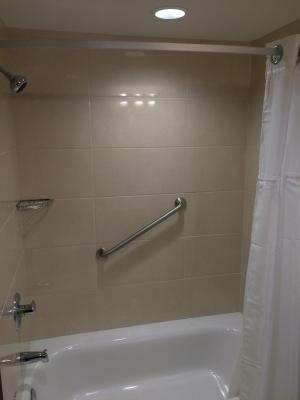 There was room for only one big bath towel on the hook behind the door. Other than this minor detail, the hotel exceeded my expectations. Oh my goodness . . .this was the best boutique experience ever!! When we arrived at 2:00 am, the receptionist made us feel so welcome and she told us about the best restaurants, the chocolate shop, and other things of interest. 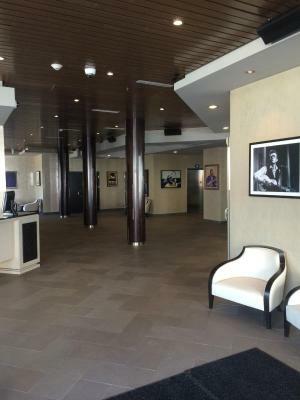 The hotel is so clean and the art work (musicians) made me feel like we were in a museum. The rooms were perfect and were so attractively decorated, but there could be a towel rack on the wall - a minor thing but there was only one hook for one bath towel. The bed was as comfortable as our own bed at home. I could have stayed there a lot longer. 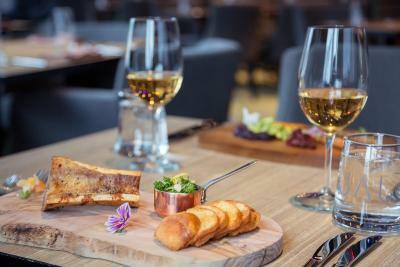 The restaurant served delicious meals, and everything was served attractively. 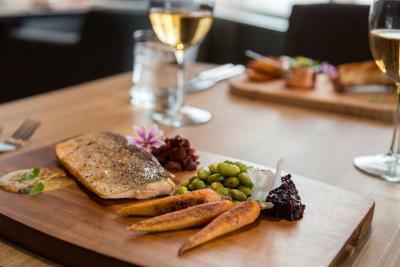 I had the cod for lunch, and it was so delicious. I would give this hotel a 5 out of 5 star rating. Best hotel I stay in anywhere. Staff are especially awesome! This hotel is great! The location is great, just at the south end of Water St but still walkable to everything downtown. It’s nice and still looks new, everything seems to be maintained well. Everyone is so friendly, the desk people, the doormen, the bar staff. The hotel staff was amazing. They helped us with lost luggage from the airport, brought us extra toothbrushes and toiletries we needed. We had an issue with our air conditioner and they had someone up in ten minutes to help us resolve it. The restaurant food was REALLY good - and priced fairly for a hotel. 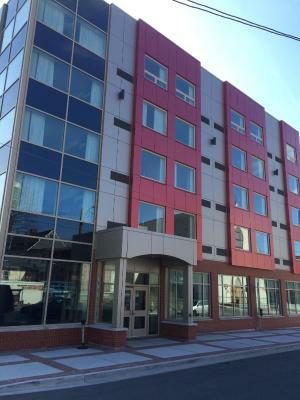 I loved the whole vibe of the hotel and would gladly recommend to anyone staying in St. John's. 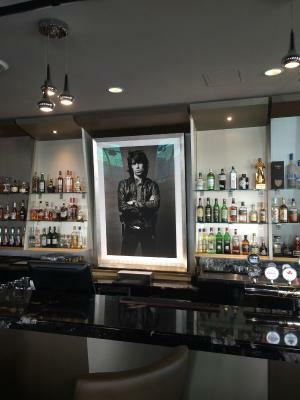 Loved this hotel and it’s musical rock and roll theme. 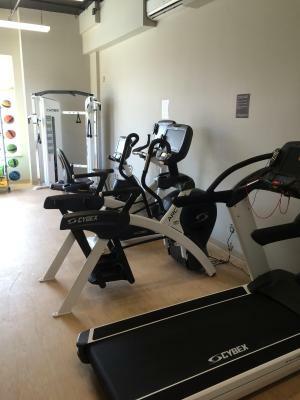 Walking distance to all the George ST. Entertainment and signal hill. 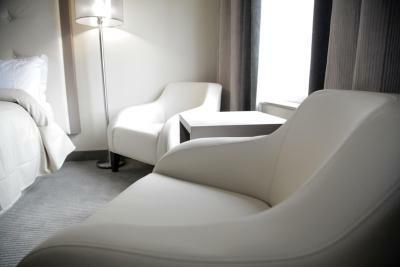 JAG Boutique Hotel This rating is a reflection of how the property compares to the industry standard when it comes to price, facilities and services available. It's based on a self-evaluation by the property. Use this rating to help choose your stay! 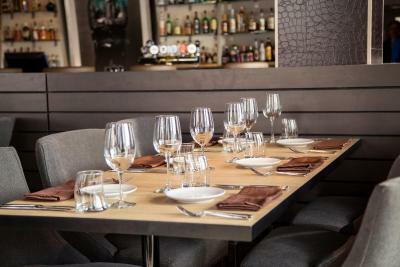 One of our top picks in St. John's.Boasting an on-site restaurant and 24-hour room service, JAG Boutique Hotel is located in St. John's. The pubs and bars of George Street are less than 5-minutes' walk away. 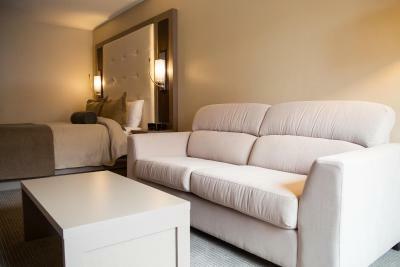 Each stylishly furnished room includes free WiFi and a 42" flat-screen LED TV with cable channels. 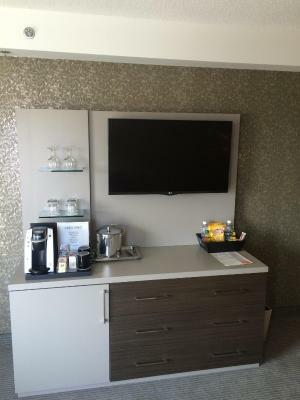 A mini fridge and a Keurig coffee machine with complimentary Starbucks coffee and tea is included. The radios are Bluetooth compatible. 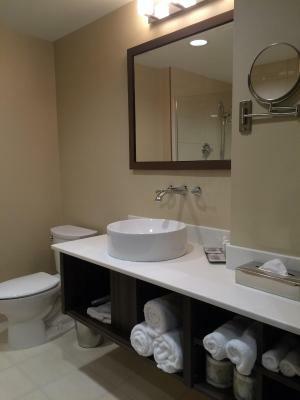 Guests will find a hairdryer, bathrobes and toiletries in the bathroom. 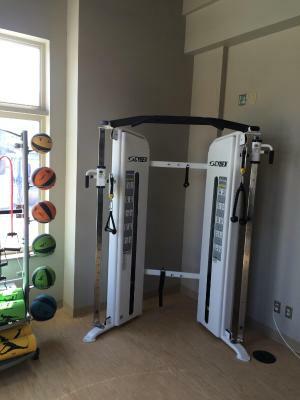 JAG Boutique Hotel offers a fitness center and a 24-hour front desk. Valet parking is available and staff are on hand to help guests at all times. 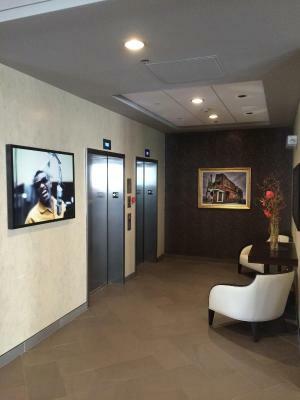 Multiple elevators provide easy access to higher floors. Signal Hill National Historic Site is 2.2 mi from this property. St. John's International Airport can be found within 5.2 mi. 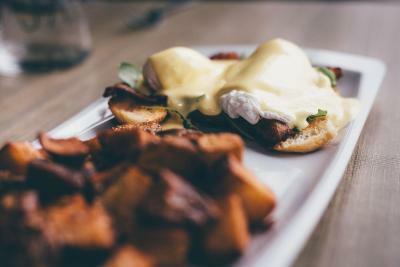 This is our guests' favorite part of St. John's, according to independent reviews. 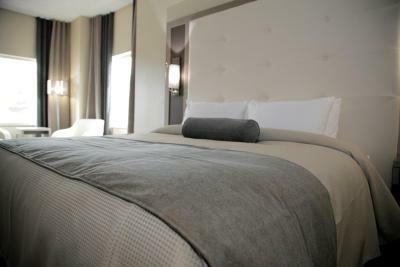 When would you like to stay at JAG Boutique Hotel? 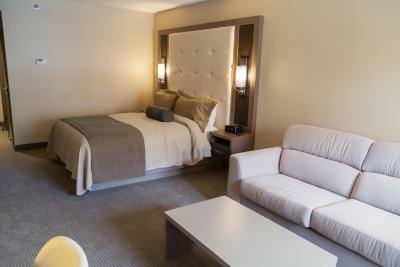 Offering a spacious room with a King Bed and pull out sofa bed, this stylishly furnished room offers free WiFi and a 42" flat-screen LED TV with cable channels. 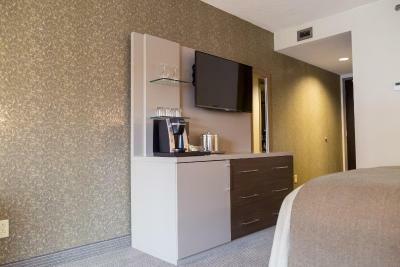 A mini fridge, in-room safe, and a Keurig coffee machine with complimentary Starbucks coffee and tea is provided. The radios are Bluetooth compatible. 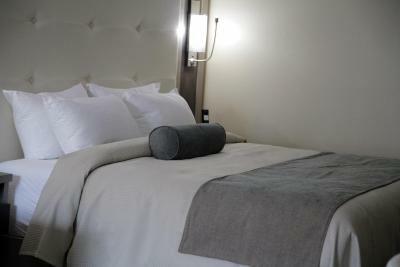 Guests will find a hairdryer, bathrobes and toiletries in the bathroom. 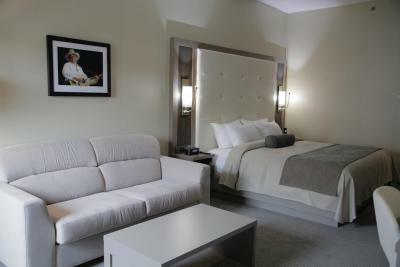 This stylishly furnished room offers free WiFi and a 42" flat-screen LED TV with cable channels. 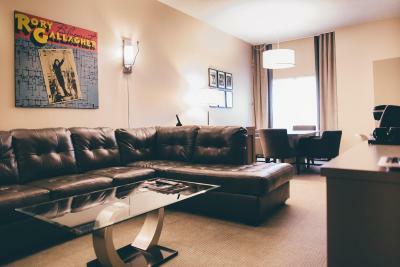 A mini fridge and a Keurig coffee machine with complimentary Starbucks coffee and tea is included. The radios are Bluetooth compatible. 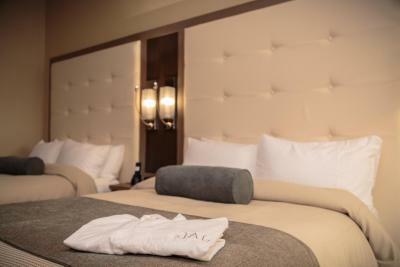 Guests will find a hairdryer, bathrobes and toiletries in the bathroom. 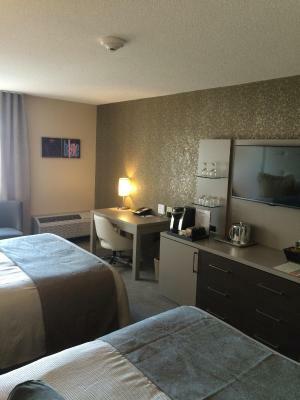 Offering a spacious room with a King Bed and Chesterfield, this stylishly furnished room includes free WiFi and a 42" flat-screen LED TV with cable channels. 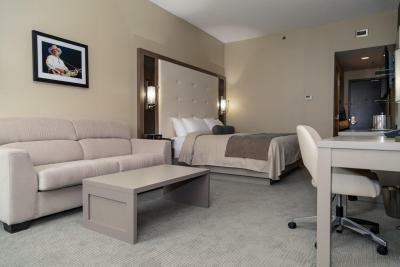 A mini fridge, in-room safe, and a Keurig coffee machine with complimentary Starbucks coffee and tea are provided. The radios are Bluetooth compatible. 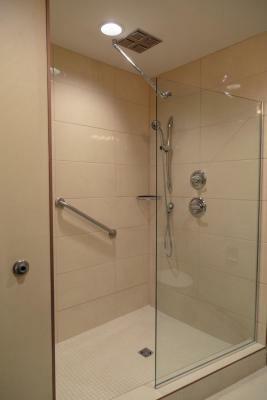 Guests will find a hairdryer, bathrobes and toiletries in the bathroom. 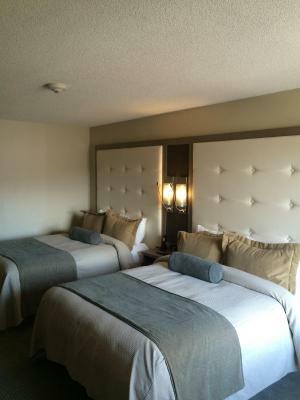 This Double Queen room includes free WiFi and a 42" flat-screen LED TV with cable channels. 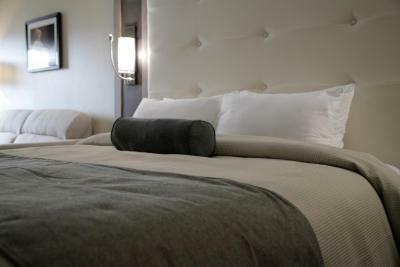 A mini fridge, in-room safe, and a Keurig coffee machine with complimentary Starbucks coffee and tea are provided. The radios are Bluetooth compatible. 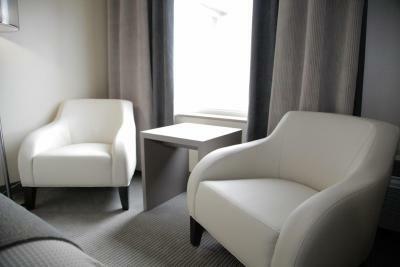 Guests will find a hairdryer, bathrobes and toiletries in the bathroom. 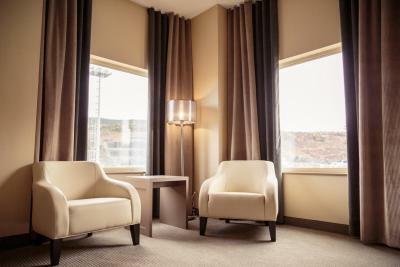 Offering more space with a Chesterfield and extra seating, this stylishly furnished room includes free WiFi and two 42" flat-screen LED TV with cable channels. 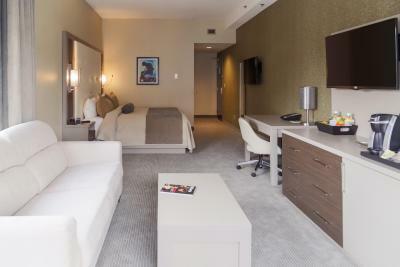 A mini fridge, in-room safe, and a Keurig coffee machine with complimentary Starbucks coffee and tea are provided. The radios are Bluetooth compatible. 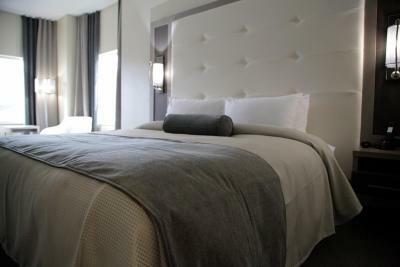 Guests will find a hairdryer, bathrobes and toiletries in the bathroom. 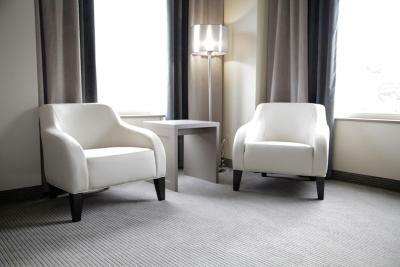 Offering more space and a sofa, this stylishly furnished room includes free WiFi and a 42" flat-screen LED TV with cable channels. A mini fridge and a Keurig coffee machine with complimentary Starbucks coffee and tea are provided. The radios are Bluetooth compatible. 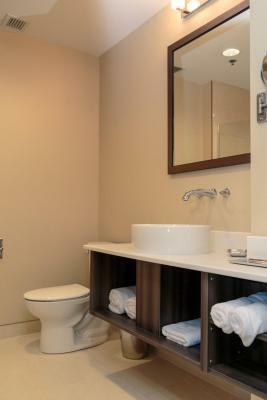 Guests will find a hairdryer, bathrobes and toiletries in the bathroom. This accessible room has a sofa, soundproofing and air conditioning. This suite features a private entrance, soundproofing and flat-screen TV. 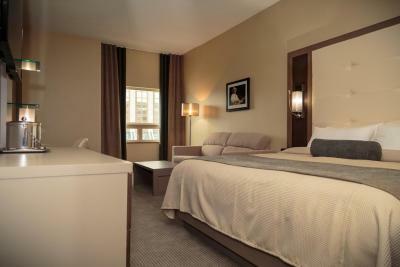 Our hotel is a masterpiece within the heart and soul of North America’s oldest city. 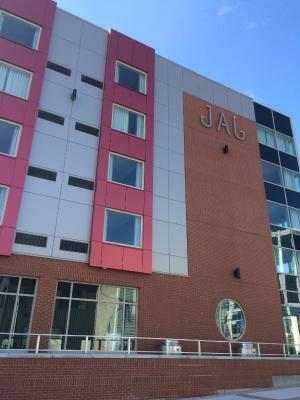 Nestled between the lively George St. West and the historic and scenic Water St., JAG is conveniently located next to major meeting venues, local shopping, live entertainment and fine dining. 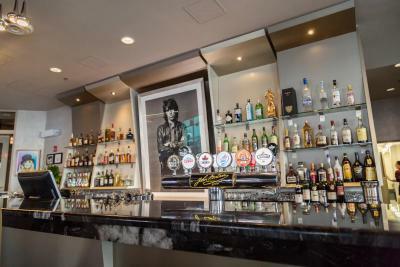 There’s no need to choose between night life and business, with JAG perfectly placed in the downtown entertainment and business hub of St. John’s, Newfoundland. JAG is rich in culture and history, and it hums with the life and vibrance of the colourful community surrounding it. 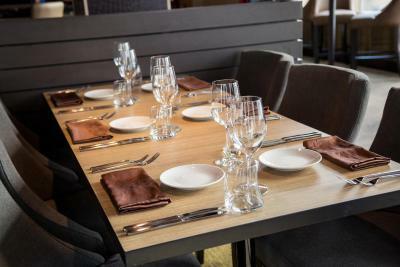 We take pride in our attention to detail, but more importantly, we take pride in offering our guests an outstanding experience. 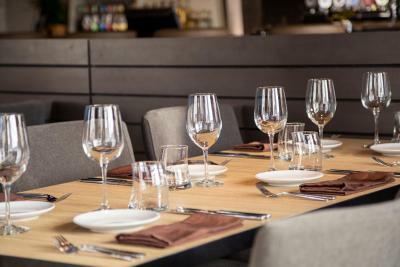 Make a reservation today. 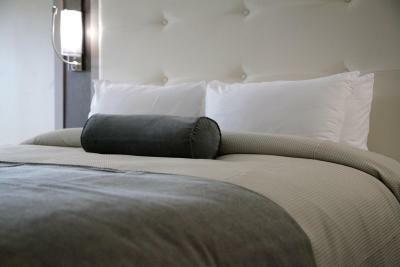 House Rules JAG Boutique Hotel takes special requests – add in the next step! JAG Boutique Hotel accepts these cards and reserves the right to temporarily hold an amount prior to arrival. Please note, private underground valet parking is available but there is limited space. The cost is CAD 19/day. A damage deposit of CAD 300 will be required. Please inform JAG Boutique Hotel of your expected arrival time in advance. You can use the Special Requests box when booking, or contact the property directly using the contact details in your confirmation. 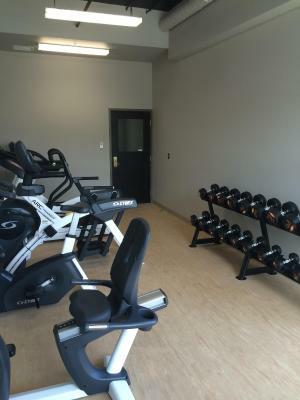 The fitness room needed a little care. Dinner and drinks in the restaurant/bar was great as always. Good service and tasty food. Wifi connection was not good. Comfy bed,real drinking glasses not styrofoam.Awesome music scene and restaurant was excellent!! The bed was soooo comfy. The room cozy. 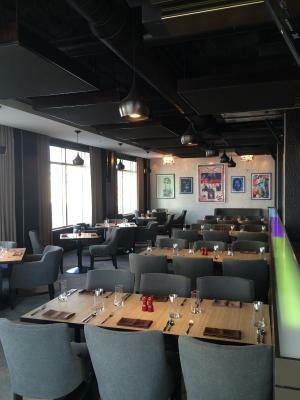 The service was excellent at check in and in the restaurant. Love the music in the morning. 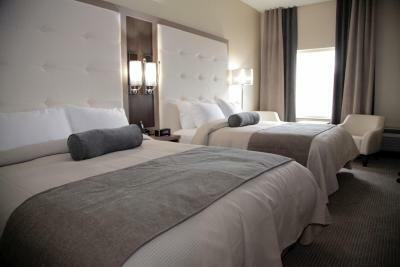 Very comfortable rooms, with excellent towels and amenities, very restful after a long work day and inter-provincial travel. Very nice breakfast. I feel they need better charging station in the room for phone, computer etc. Every thing was great, Restaurant food was very good. Breakfast omelette with room service very sub par for this establishment. Spoke to manager on the way out .